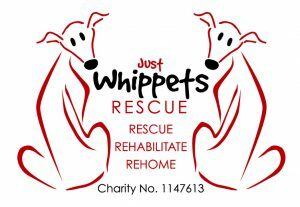 Just Whippets Rescue is a registered charity who’s propose is to rescue and re home whippets in need. It was established in 2010 and since then has re homed over 400 dogs. Just Whippets Rescue is an organisation set up to rescue, rehabilitate where necessary, and re-home whippets in need of care and attention by reason of sickness, maltreatment, poor circumstances or ill usage. We will never permit a dog in our care to be put to sleep unless recommended by a vet. We also provide a re-homing service for whippets whose owners who can no longer keep their much loved friends due to circumstances beyond their control. This service guarantees that their whippets are placed in safe, loving forever homes. Rescue – to free or deliver from abuse, misuse or privation. Re-home – to place in a carefully vetted ‘forever’ home Scruples operates throughout England, Scotland and Wales via a network of approved foster carers and volunteers. Just Whippets Rescue does not operate an animal shelter as such, instead whippets in our care enjoy all the comforts of a family home whilst being rehabilitated and/or awaiting re-homing.